I ♡ lists! 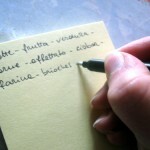 Making lists provides a provocative, probing expedition into your mind, heart and soul. I invite everyone who reads this to complete one of these lists!! In the classroom, this provides a fabulous writing warm-up or a lesson in itself. Students can choose one item on their lists to elaborate on further. Let’s list!! Care to share your list?! Really good ideas for a lot of writing. With 50 weeks of blog posting for the postaday2011 challenge left I might need to come back to this a few times. I didn’t originally write it for PostADay ideas but, as I was typing, I realized some of these could be used for that!!! I love lists, I love making them but what I find myself doing is not acting on them, if they are action lists. I kind of keep them and re-write them and then lose them. I still love making them though.